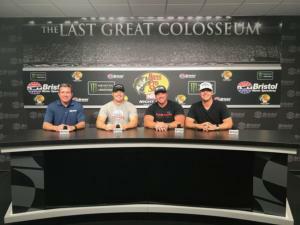 Three stars from the Volvik World Long Drive Championship visited Bristol Motor Speedway Monday afternoon and did some driving of a different kind on the all-concrete high banks of the World's Fastest Half-Mile. 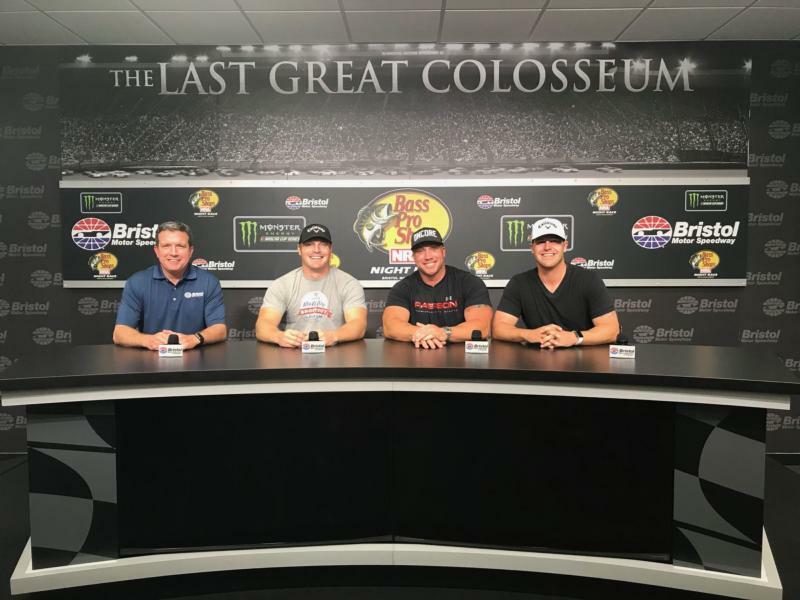 Will Hogue, Ryan Steenberg and Wes Patterson enjoyed a tour of Bristol Motor Speedway and took some hot laps in an official Chevrolet Camaro SS pace car that will be used in Saturday night's Bass Pro Shops NRA Night Race Monster Energy NASCAR Cup Series race. The Long Drive competitors are in town for the Tennessee Big Shots tournament that is being held today at Cattails Golf Club at the Meadowview Resort in Kingsport. Coverage of their event airs tonight on Golf Channel from 6-8 p.m.
Bristol Motor Speedway executive vice president and general manager Jerry Caldwell sat in the driver's seat and gave the trio a few introductory laps with tips and pointers as they rode shotgun. He then gave each of them permission take their own laps around the historic NASCAR short track at the controls of the high-horsepower pace car. Hogue, who is currently No. 2 on the World Long Drive points list with three victories, posted the quickest lap of the group at 26.17 seconds at an estimated 94 mph. Hogue, whose longest drive in competition is 483 yards, said taking that lap made his legs quiver. "It was so cool," Hogue said. "Not a whole lot turns my legs to jelly, but I hit 94 miles per hour going into one of the turns and felt my legs shaking and going weak and I had to slow down a little bit. I have no clue how these guys race around this place at 130 miles per hour. That is so impressive. I was trying not to smash it into the wall. You have to be incredibly brave to do what they do because that was insanely nerve wracking." Steenberg clocked a lap at 89 mph, or 27.77 seconds. The Rochester, N.Y. native said he's never driven a race car before and that was quite a rush. "To have control of that machine and understand how much power you have on the front end, I love it," said Steenberg, who is fifth in the World Long Drive standings with one victory this year and a career long drive of 485 yards. "The more laps you get the more comfortable you get," Steenberg added. "It's wild. It's like us with the Long Drive events, it's all adrenaline. I tried to get up high (along the wall) and see what that felt like. It really gives you an appreciation for what (the NASCAR drivers) do. I can't imagine 40 deep on this track going 130 miles per hour. Yeah, those guys are crazy." Steenberg said he has been asked a few times if NASCAR drivers are athletes. He says that's a no-brainer. "No question they are elite athletes," he said. "To be able to endure the amount of G-forces and the four-and-a-half hour marathon that the race is, not to mention the hydration issues and heat. Oh yeah, they've got to train for this stuff." Former baseball player and relative newcomer to the World Long Drive tour Patterson climbed out of the pace car after his solo lap of 86 mph (27.79 seconds) with a huge grin on his face. "It was fun," Patterson said. "It was crazy. I got up to about 86 (mph). It is harder to get up close to the wall than you would think it is. I got up there kinda close one time. It's awesome, once you get turning and punch the gas, you get into the groove. It's hard to take it all in. I can't imagine 40 cars going 120 miles per hour around this place with all the fans packed in here. It puts it in perspective and I have a new found respect for those guys." To see the other greatest drivers (of stock cars, not golf balls) in the world, like Kyle Busch, Kevin Harvick, Martin Truex Jr., Chase Elliott, Ryan Blaney and many more, this weekend's racing action at BMS is sure to fit the bill. The Monster Energy NASCAR Cup Series machines roll onto the track for the fabled Bass Pro Shops NRA Night Race on Saturday night (7:30 p.m. ET, NBCSN). On Friday night fans will be at the edge of their seats when the XFINITY Series stars rumble around the World's Fastest Half-Mile during the Food City 300 (7:30 p.m. ET, NBCSN). A Thursday night double-header will kick off the weekend when the Camping World Truck Series stars take the green flag for their final regular season race, the UNOH 200 (8:30 p.m. ET, FS1). The first part of the double header is the Bush's Beans 150 NASCAR Whelen Modified Tour event (NBCSN, Wed., Aug. 22, 6 p.m. ET).